Back of the Cereal Box: Refinance Your Home or Rot in the Street! Your Choice! Refinance Your Home or Rot in the Street! Your Choice! I am baffled by the use of the mug shot-looking photo of Mr. Scary in this ad for home refinancing from LowerMyBills.com. 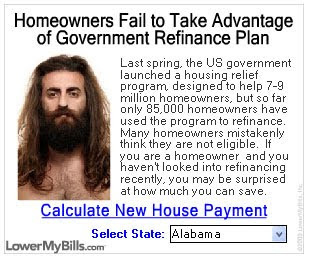 Is the ad implying that not taking this refinancing offer will render you homeless and therefore hairy-faced? Is it saying that you passing on this offer will literally make you lose your shirt? Apparently a site called classesUSA is also using that picture (sans hairy chest). It's even weirder considering that the "headline" for the advertisement is "Obama Asks Moms to Return to School: Financial Aid Available to Those Who Qualify." He also brags about how he makes more money than he could ever dream of, which is more than the reader of the ad. Strange! I dunno. The tactics these B class Ads use seem rather random. Apparently people believe that "moms", ascribed no particular qualification than having performed birth, are better suited to tell you how to whiten your teeth. The guy is kinda hot in a neolithic sorta way. The new marketing strategy enabled by the internet: "lets try a much or randomness and see what gets clicks." Then we're agreed. Randomness rules when it comes to these adds. I mean hell --- it got my attention, didn't it? I saw this same picture in an ad for "Obama wants single mothers to go back to school" WTF? I guess they figured if they used Mr. Scary women would go rushing back for higher education rather than taking their chances with Mr. Scary?